If you are looking for the perfect external battery pack you can take with you on the go then come checkout this power bank from OrigAudio. This power bank has a capacity of 10400 mAh and has 3 port to charge from so that you phone, iPad and something else can charge at the same time. The OrigAudio power bank has 3.1 amp witch will help with quickly charging you device. 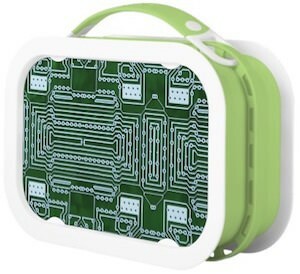 You can get this power bank in black or white and has a picture of a blue colored circuitboard on top to make it look geeky and cool at the same time. Come check out the OrigAudio Blue Circuit Board 10400 mAh Power Bank. Packing a present for a geek? 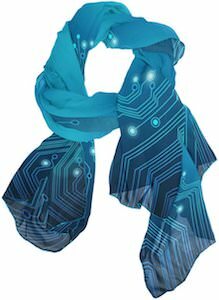 Or just like to decorate things the geek way? This Washi tape is the role to get. 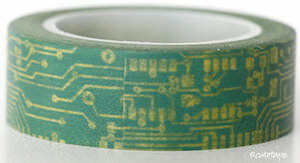 The tape is green and on it you can find a circuit board pattern. Just imagine everything you can do with this fun looking tape. Use it to decorate boring binders, journals and things like that. The options are limitless and luckily this circuit board tape is 15mm wide and 10 meter long so that you have plenty for all your projects. Do not wait any longer and just come and order your role of Circuit Board Washi Tape. Cold drinks are nice but the down side is they don’t stay cool and your hands get cold when you drink them. Now there is a solution for both problems and that is a can and bottle koozie. 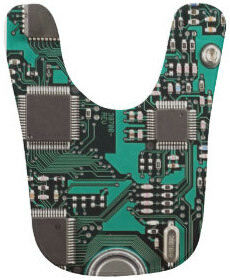 And this koozie has a design of a circuit board on it making it extra geeky and that means better. The fun design also hides what you are drinking. Wow all those features in a small piece. 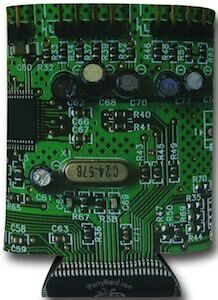 Come and take a better look at this Circuit Board Can And Bottle Koozie. How do you wrap gifts for tech geek? In circuit board gift wrap of course. This wrapping paper looks just like a circuit board and that makes the presents look fun and different. 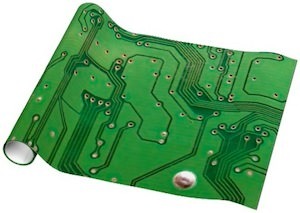 So if you have a geek to wrap for then you have to check out this Circuit Board Wrapping Paper. Batman fans who like technology will like this t-shirt. This Batman t-shirt is a charcoal color and on that you have the famous Batman logo but the logo is not the usual black and yellow not this time it is made out of a circuit board with lots of green and. So now you can show the world a Batman t-shirt that not everybody wears no this one is special and that is why you want it. This Batman t-shirt is made of 100% cotton and is preshrunk. And it is available in a wide selection and even different styles. 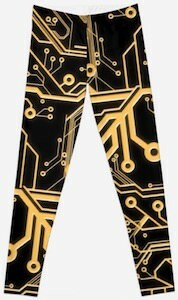 So before you do anything else you just need to see this up close so come see this Batman Circuit Board Logo T-Shirt.